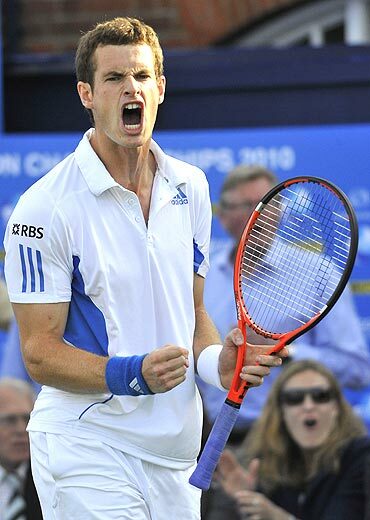 Champion Andy Murray and Andy Roddick whacked away the clay from their tennis shoes and began their build up to Wimbledon by beating little-known opponents on a rain-blighted day at Queen's Club on Tuesday. Murray, who last year became the first Briton to win the title in 71 years, kicked off his grasscourt campaign with a 7-6, 6-3 win over Spaniard Ivan Navarro while Roddick was at his ruthless best in a 6-2, 6-1 demolition of Russia's Igor Kunitsyn. Third seed Murray initially seemed taken aback at the sight of a serve-and-volleying Spaniard but once he had got over that shock he found his groove to book a place in the third round. "Tricky play, not what you expect from a Spaniard coming forward on every point," Murray said in a courtside interview. That win, and the feel of grass beneath him, would have come as a relief to Murray who has endured a wretched run since finishing runner-up to Roger Federer at the Australian Open. He has yet to win a title in 2010 and went out in the fourth round of the French Open. At times on Tuesday it seemed as if Murray had forgotten that he had left the claycourts behind as he repeatedly slapped his heels as if trying to get rid of the red dust from the soles of his shoes. Murray would also have expected Navarro, whose stocky build would not look out of place on a rugby pitch, to hug the baseline since the world number 108 hails from Alicante. However, Navarro showed off his grasscourt skills as he attacked the net at every opportunity and with a little more experience he could have stolen the first set. "I just managed to get him in the tiebreak but it was definitely tough," said Murray, who walked into his news conference holding a large ice pack wrapped around his right knee. "It's nice to see someone serve and volley. I haven't played a serve-and-volleyer this year so it was tricky and he did it very well." "I'm excited to be here...it's a comfortable adjustment for me," a beaming Roddick said as he fiddled with his white baseball cap. While Murray and Roddick were glad to finish their matches in one take, others had to endure a stop-start day as rain swept across west London. Sixth seed Gael Monfils probably felt he would have been better off joining fellow Frenchman Michael Llodra and Julien Benneteau in kicking around a football on the practice courts after he went down 6-3, 6-7, 6-2 to Germany's Rainer Schuettler. A one-hour rain break at 6-6 in the second set offered Monfils some respite, as on resumption he won the tiebreak 7-4, but the elastic-limbed Frenchman eventually bounced out. 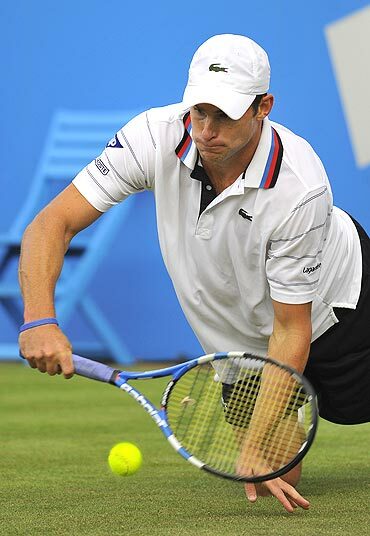 His compatriot Richard Gasquet avoided the same fate with a 6-3, 7-5 win over American Rajeev Ram.